為什麼我需要Beltone Direct Phone Link 2才能使用該應用程式? Which mobile device do I need to use the app? iPhone/iPad/iPod touch or Android smartphone/tablet. Please note that the app is not compatible with all Android devices. Which operating system must my mobile device have? iOS: Operating system 7.0 or later. Android: Operating system 2.3.5 or later. Please note that the app is not compatible with all Android devices even if the requirements for operating system are fulfilled. How do I pair my mobile device to my Phone Link 2? Inside the app, you will find pairing guidance under Settings. You can also go to www.beltone-hearing.com/smartremoteapp and download the Quick Guide for pairing guidance. I’ve downloaded the app and paired my mobile device to my Phone Link 2. Now what do I do? Step 1: Do you want to connect now or run in demo mode? Choose connect now. Step 1a: (Only on Android) Required devices: We inform you that you need Beltone wireless hearing aids and the Beltone Direct Phone Link 2 (released Dec. 2012) to operate the app. Step 3: We recommend that you disable any lock sounds, keyboard clicks and other touch sounds on your mobile device to improve your user experience. This is usually done under Settings and Sound. Step 4: You’re ready to run Beltone SmartRemote. If you need any guidance on how the app works or how to pair to the Phone Link 2, that information is available under Settings. I’ve downloaded the app but I can’t find it on my phone? 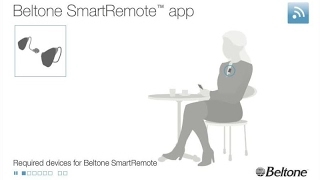 You will find Beltone SmartRemote listed with your other apps under ‘SmartRemote’. Did you remember to disable your phone’s lock sounds, keyboard clicks and other touch sounds? Whenever the Phone Link 2 detects that there is a sound from the mobile device, it assumes you will want to hear that sound in your hearing aids so it automatically changes to a phone streaming program. It will change right back when the sound stops. You can limit this by disabling unnecessary sounds, for example lock sounds, keyboard clicks and other touch sounds (disable under Settings on your mobile device) and you can also set text message and other alerts to Vibrate Only, not tone. Why does my app look different from what I see on the web landing page? All images on the landing page show the iPhone version of SmartRemote. On Android, the app might look a little different in order to stay true to that platform. The appearance is also dependent on how each Android phone is designed. All basic functions are the same. What is the difference between the white and the green volume bars? The white volume bars are for your hearing aid microphones. The green volume bars are for your streaming device, Beltone Direct TV Streamer 2 or Beltone Direct MyPaL, and/or for your phone calls and phone music. On Beltone True devices you will only see one kind of volume bars – they will adjust both hearing aid and streamer volume at the same time. Can I mute the sound? Yes, you can mute the sound from the hearing aid microphones. Just tap the mute button. Your options for muting the sound from a streaming device are to either turn the volume down or to choose a non-streaming program. Can I mute the sound on ONLY my right or left hearing aid? Yes, just slide right or left on the volume screen and press the ‘half’ mute button. Why do I not see the mute function on my app? If you have Beltone True wireless hearing aids, the mute function is not available. How do I make volume adjustments to ONLY my right or left hearing aid? Slide right or left on the volume screen and make your desired adjustment. Please note, if you have wireless hearing aids where volume synchronization is activated, your hearing aids will always synchronize volume. If you would like to be able to make single-sided volume adjustments on the app, please talk to you Hearing Care Professional at your next visit. How do I reset volume to default settings? Either slide the volume bars up or down until the ‘punch holes’ are visible in the top white bar or re-choose the program on the program selection screen. Can I use the app to adjust phone volume during calls or while streaming music? Yes, with most Beltone wireless hearing aids, you can use the green volume bars on the volume screen to adjust the volume level. With Beltone True hearing aids, you will be adjusting the volume of both the hearing aids and the streamed sound. What are the small ‘punch holes’ on the volume bars? The ‘punch holes’ indicate your default volume setting. Why can I not change programs while I’m listening to music or am on a phone call? When you receive sound from your mobile device, the hearing aids automatically move to a streaming program. In order to go back to a hearing program, please exit the active phone operation. Why can I not change programs at all? Why do my hearing aids change programs at message alerts, keyboard use and locking the phone? Whenever the Phone Link 2 detects that there is a sound from the mobile device, it assumes you will want to hear that sound in your hearing aids so it automatically changes to a phone streaming program. It will change right back when the sound stops. You can limit this by disabling unnecessary sounds, for example lock sounds and keyboard clicks (disable under Settings on your mobile device) and you can also set text message and other alerts to Vibrate Only, not tone. If I edit the names of the programs, will my Hearing Care Professional be able to recognize them? Yes. Editing names of programs is only stored in the app. When your Hearing Care Professional reconnects your hearing aids to the fitting software in his/her office, the fitting software will overwrite the changes you made. If you want to keep the names you edited, either ask your Hearing Care Professional to enter them in the fitting software or edit them again after your visit. Why did I lose my personalized program names that I entered? Why did the name of the program change when I chose it? If your Hearing Care Professional has entered names of your programs in your hearing aids that are not default from the manufacturer, you will see these names after the first time you enter a program. I have turned on the Phone Link 2 but my mobile device is not making the Bluetooth connection. Did you pair the Phone Link 2 with your mobile device? If not, please see info on the web landing page for how to get started (www.beltone-hearing.com/smartremoteapp). If you did pair the two devices, connection should happen automatically. If not, go to the Bluetooth settings of your mobile device and click ‘Hearing Aid Phone’ to connect. Most mobile devices will display a small Bluetooth or headset icon in the top status bar when actively connected. My phone is connected via Bluetooth to the Phone Link 2 but the app says it is not connected to the hearing system? In rare cases, it may happen that the app cannot detect the Bluetooth connection established between the phone and the Phone Link 2. Please try to turn off the Phone Link 2, wait three (3) seconds, and then turn it on again. What do the lines on the Link screen mean? Green line: connection established. Red line with exclamation mark: connection missing. Press mark/line for troubleshooting. Grey dotted line: Pairing of streaming device exists but the device is not currently connected. Turn on device to connect to hearing aids. What is the red exclamation mark on the Link button trying to tell me? You are likely to be missing a connection between your mobile device and your hearing system. Tap the button and you will see an overview of the connections between your mobile device, your Phone Link 2, your hearing aids and your streaming device (if you have a streaming device paired in). If a particular connection is not established, the line will be red and have an exclamation mark on it. Tap the exclamation mark or the red line to get some tips for reestablishing the connection. Can I get the app in a language other than English? Yes, the app is also available in Czech, Danish, Dutch, French, German, Greek, Hungarian, Italian, Japanese, Korean, Norwegian, Portuguese, Polish, Romanian, Slovakian, Spanish, Swedish, and Chinese (traditional). Enabling Demo mode means that you can run the app without connection to the hearing system for demonstration purposes or just to try it out. You can enable/disable Demo mode under Settings. On an Apple device: Put your finger on the launch icon on the home screen and keep it there until it starts ‘shaking’ and a little ‘x’ appears. Tap the ‘x’ to delete the app. Confirm deletion. Then press the Home button to return your home screen to normal. On an Android device: Ways to remove apps vary on Android devices – please consult your smartphone user guide.